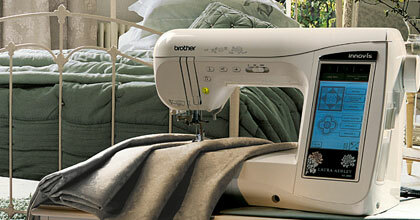 The Brother Innov-is NX-2000 Laura Ashley Limited Edition is sure to please anyone who loves to sew home décor items. It offers a delightful range of features including: Automatic height adjuster feature that detects varying fabric thicknesses for uniform stitches, Pivot feature to allow for perfect corners every time, 460 sewing stitches and the exclusive Brother® My Custom Stitch™ feature to create and save an almost unlimited number of personalized stitches in the machine’s expansive memory. Exciting specialty accessories such as a circular attachment and a bobbin work bundle add beautiful embellishments to any sewing project. Quilters will love the extra-large quilting extension table that supports the largest projects as well as the three specialty feet for smooth free-motion sewing. With a Laura Ashley Limited Edition Sewing Machine, creating sophisticated and stylish home décor has never been easier!